Common Pavilions is based on an exhibition curated by Diener & Diener Architects within the 13th International Architecture Exhibition of the Venice Biennial in 2012. Architecture’s social and cultural reality was the theme of the 2012 exhibition, titled «Common Ground». Bringing the architectural significance of the 29 national pavilions to the attention of visitors, who usually do not really notice these buildings and their individual character and atmosphere when seeing an exhibition there, was the aim of the Common Pavilions project. The celebrated Italian photographer Gabriele Basilico (1944–2013) has taken pictures of all the pavilions in the Giardini di Venezia. His masterful images are featured in large-format and lavish duotone printing. 30 authors from all 29 nations – architects, philosophers, and artists – have contributed short essays, writing on “their” national pavilion, its history and its identity as a space for presenting art. The essays appear in the book in English and in their original national language. Basilico’s images and the essays merge into a rich and atmospheric panorama of what is probably the world’s best known exhibition site. A selection of Gabriele Basilico's photographs is on display at Galerie Aedes Am Pfefferberg in Berlin. 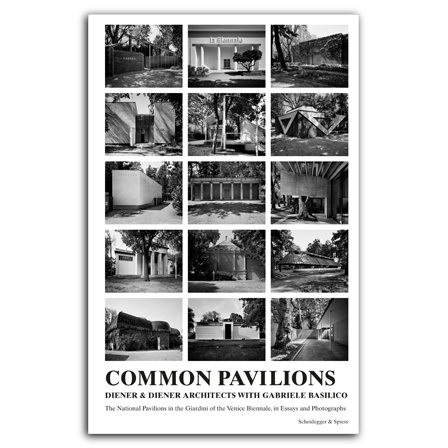 Common Pavilions won a gold medal in the 2014 German Photo Book Award. Designed by Robert & Durrer. (1944–2013) ranks among the most celebrated Italian photographers. His work has been shown in many exhibitions and books, including Porti di mare (1990), Italy: Cross-Sections of a Country (1998), Berlin (2001), and Vertical Moscow (2008). is a Swiss architectural firm with offices in Basel and Berlin. Among their best-known projects are the restoration and extension of the Swiss embassy in Berlin, the refurbishment of the Museum für Naturkunde in Berlin, and the Forum 3 building on the new campus of Swiss pharmaceuticals company Novartis in Basel. (*1970), director of Kunsthalle Basel since 2003. Co-founded the Foksal Gallery Foundation in Warsaw in 1997 and curated the 5th Berlin Biennial for Contemporary Art together with Elena Filipovic in 2008.